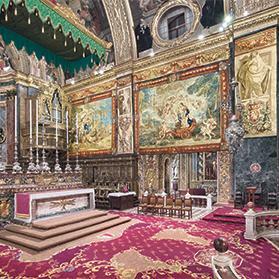 For the next couple of years at least, we will not be able to admire the magnificent set of tapestries that Grand Master Perellos donated to the conventual church of St John’s as his gioia. Eventually, a new bespoke museum will be built where they can be admired in all their glory which has not been the case since they unfortunately stopped being hung in their proper place along the nave of the church. The risk of damaging this priceless heritage in the annual process was then rightly but sadly considered too high a price to pay. 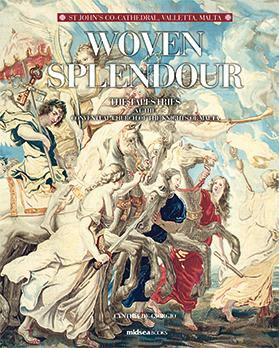 Still, all those who wish to feast their eyes on these magnificent works of art and to learn about their history and the background to the commission can’t do better than turn to Cynthia de Giorgio’s excellently researched account, Woven Splendour, which incidentally also serves as the companion volume to her other volume on the church itself. With the main photography being carried out by Joe P. Borg, who has earned such a deserved reputation as a photographer of works of art and architecture, this book is a sheer pleasure to leaf through. Indeed Borg’s close-ups enables one to appreciate the consummate, not to say miraculous, skill of the weavers much more than if one were to see the tapestries in person. Raimundo Rabasa de Perellós y Rocafull, to give him his fine-sounding name in full, became grand master of the Order in 1697. Born in Aragon, he had been in Malta for 44 years since he had joined the brotherhood at the age of 16. All brethren earning a promotion were expected to donate a costly gioia to the Order within the first five years of their promotion. Eventually, his choice fell on a magnificent set of tapestries for the conventual church, which had just gone through its definitive transformation under Mattia Preti, who then had still two more years to live. Almost 50 years earlier, the sovereign of the Southern Netherlands Isabella, had commissioned the weaving of a set of 20 tapestries glorifying the Triumph of the Eucharist in a climate inspired by the counter-reformation in Europe. The subject of the triumph of the Eucharist and the belief in transubstantiation were, of course, central to the Catholic Church’s opposition to the Protestant reformation. Isabella donated the set to the Franciscan nuns of the Monasterio de las Descalzas Reales in Madrid where, as in the rest of Spain, the feast of Corpus Christi is celebrated on a grand scale. 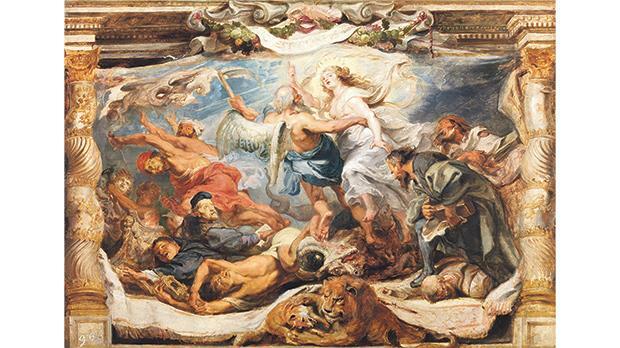 In 1622 Peter Paul Rubens, who had just been appointed court painter to Habsburg court in Madrid and Brussels, was commissioned to create a series showing the triumphs of the Faith which was woven into tapestries and presented to the nuns, among whom Isabella had planned to pass her last days. The Eucharist series was the only one Rubens designed for a specific place in mind, which explains its architectural perspective directions and the light effects. Rubens started by drawing small oil-on-panel bozzetti, which he then used to produce detailed modelli, from which full-size cartoons were made to pass on to the weavers in Flanders. De Giorgio goes into great detail regarding the commission and Rubens’ plan and execution of the bozzetti and the modelli... details which have hitherto been not generally available locally. She explains well the theological aspect of the set. Of great relevance and importance are the illustrations of some of the bozzetti and modelli which are to be found in Prado Museum and the Fitzwilliam Museum in Cambridge. Perellos was elected grand master in 1697 at the age of 60. His magistry, which came at a time when Mediterranean politics were undergoing significant changes, was marked by several important decisions, not the least being the one that saw the foundation of the ship-of-the-line squadron which partly offset the endemic problem of finding enough slaves to man the oars of the galleys. He was also the generous donor of the other magnificent set of tapestries, the Tenture des Indes, this time from the Gobelin weavers, that adorn the council chamber at the grand master’s palace and which he ordered in 1707. 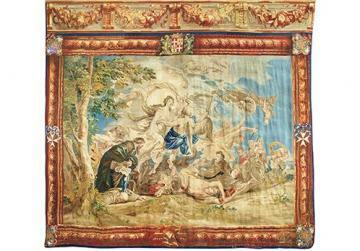 The St John’s tapestry set was commissioned from the workshop of Jacobus de Vos in 1698, barely a year after his election. The commission threw the city into jubilation as it assured work for the expert weavers for a number of years. 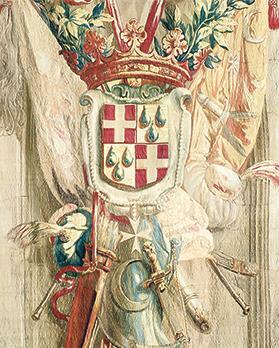 Perellos’ coat of arms features prominently in the tapestries making it simply unmissable. His own portrait was meant to hang over the main entrance, certainly place of great honour from where he would cast his affectionate gaze on his costly gioia. Tapestry was a most expensive art form, requiring many expert hands for many months. Perellos’s set consists of 29 pieces and was surely the most significant artistic donation made by any grand master. The commission, which cost an astronomic 40,000 scudi, was so big that it is reported that the people of Brussels were en fete for a whole week. The tapestries are massive in size, being just over six metres high. Fourteen are 6.5 metres wide. It is nothing short of miraculous that the famous Jacobus de Vos workshop managed to finish them by the early months of 1701. Most interesting in the book is the study of de Vos’s atelier which was at the time one of the most renowned in Europe. This aspect has rarely been treated locally and never in such detail. 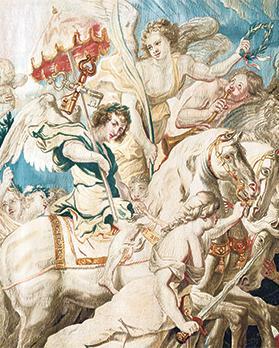 Of the St John’s tapestries, six are borrowed from the Madrid Eucharist set and directly inspired by the Rubens originals, but ‘modernised’ to suit changing artistic tastes by the new cartoon-maker, who also had to plan for larger dimensions. De Giorgio also discusses the identity of the artist who sketched Perellos’ portrait for the tapestry that overhangs the main door. It is traditionally attributed to Preti, but the problem lies in the fact that the Calabrian artist died in 1699, months before Perellos corresponded with Brussels on the subject. It is quite probable that the cartoon was produced in Brussels. Each of the tapestries, as well as the tapestries of the 12 Apostles, the Virgin Mary and Christ the Saviour, is exhaustively described and artistically assessed, which should add to our appreciation of this fascinating complex. These ‘small’ tapestry pieces were meant to hang on the church’s pilasters between the large tapestries to give the impression of an uninterrupted continuous series. At the bottom of each is the ubiquitous coat of arms of the generous donor. Perellos died on January 10, 1720 at the age of 84 from complications of gout, after having ruled for 23 years. His was indeed a most productive reign for the islands and included various victorious naval battles as well as the improvement in the fortifications. But, for most of us, his name will remain indelibly linked to the splendid tapestries that helped to transform St John’s into that enchanting jewel we should hold so dear.